One of the things I am proudest of with regards to E-creation and our marketing has been our business cards. Every time I go out networking, when I pass over a business card, people pause and say, 'hey, that really cool!' or 'that's clever!' 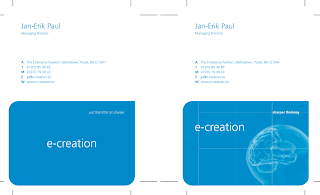 For some businesses, their business cards are not an intelligent marketing tool that wins them business - for E-creation it is. So when I ran out of cards, did a reprint 2 months ago, only to find that all our cool business cards had been print in black instead of our E-creation blue - I was bummed out. The concept of the card still worked - our business moto of 'just that little bit sharper' was still communicated by the three rounded edges of the card and the one pointed corner with the 'just that little bit sharper' but it didn't feel as cool or clever in black. So that's been sorted today! Of course, we want our clients to have cool business cards as well - and that is something that's really not expensive even for a small business to achieve, but can make a MASSIVE difference to how well it performs as a business. Hopefully, tomorrow, I will be able to upload a little concept we have come up with for a local business that creates living plant arrangements for offices. I'll show you the before and after shots - and you let me know how differently you perceive the business!